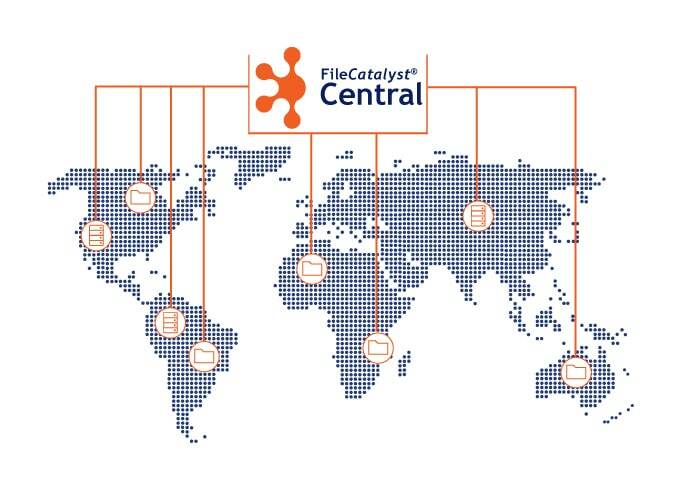 FileCatalyst Central is a web application used to monitor and manage an organization’s entire FileCatalyst deployment. Central allows administrators to view ongoing transfers in real time, dig into transaction histories, manage or monitor alarms, manage nodes and initiate node-to-server transfers. Administrators may also edit configuration of all the connected nodes, including FileCatalyst HotFolder (HF) and TransferAgent (TA). Written in HTML5, Central is firewall friendly and integrates seamlessly with all products in the FileCatalyst suite. FileCatalyst Central is a web-based monitoring tool that acts as a united gateway to your entire FileCatalyst deployment. Central allows you to view ongoing transfers in real-time, drill into transaction histories and reports, view alarms, remotely configure nodes and initiate file transfers. From a single map view, you can inspect connected nodes and remotely control them. FileCatalyst Central provides visibility to all FileCatalyst client applications and server nodes in a single centralized location. Adding additional nodes is easy; no additional network configuration is required for new nodes. Set a wide variety of alarms for file transfer events including successful, failed or canceled transfers. Alarms can be configured as SNMP traps, email notifications or be viewed from the Central web console. File transfers are monitored in real-time via the map or the overview page. The map view can be customized by configuring a custom map canvas and by grouping components of the FileCatalyst deployment into more complex objects. For example, an object called "Headquarters" might include a FileCatalyst Server, several HotFolders, and a few TransferAgents, while another object called "Regional Office" might only include one or two HotFolders. Several maps can be created and viewed simultaneously within a single browser. Maps can also be undocked and moved to separate screens to help create more flexible and customized views. A node in Central could be FileCatalyst Server, TransferAgent or HotFolder. From the node page, you can view all current and past file transfers, initiate ad-hoc file transfers, and remotely configure the selected node. Automated file transfers between any system running TransferAgent via any given FileCatalyst Server. The Orchestration script is provided as Command-Line tool and can be initiated from any system. The Script uses version 3.7 of FileCatalyst Central for complete visibility and reporting of the node to node transfers. Central provides a full REST API which developers can use to further expand the existing functionality. Node-to-node file transfer orchestration is available through command-line scripting, offering additional control over file transfers within your organization. 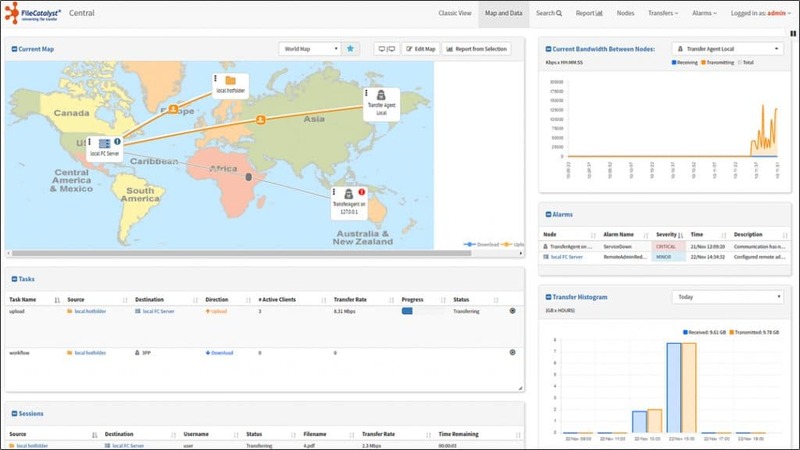 Reports are shown in near real-time. The reporting engine handles current and archived transfers with the same speed and performance. Reports are compiled based on individual nodes, groups of nodes or sessions. This gives administrators instant insight into critical file transfers and to quickly measure traffic and identify usage patterns. The new FileCatalyst Avid Interplay Delivery Accelerator plugin is designed to allow seamless delivery of files across multiple distributed Avid systems over the WAN, a process that can be time consuming with other Avid Delivery plugins. Avid users can simply select a destination to send to, and the file will be sent at the maximum possible speed using the patented FileCatalyst UDP-based Technology. The new plugin also allows better control of the overall bandwidth being used for transfers. All the data flowing between Interplay systems passes through the FileCatalyst TransferAgent and Central for orchestration. All transfers via the Delivery Plugin are visible and controlled via Central and will also appear in all the reports generated in Central.